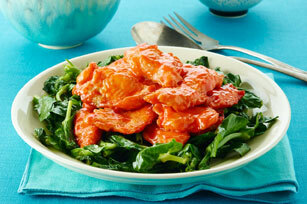 The KRAFT Russian Dressing creates a wonderful sauce for this quick fish dish. Place fish in medium bowl. Add soy sauce, egg white and corn starch; mix lightly. Refrigerate 15 min. Heat 1-1/2 tsp. oil in nonstick wok on high heat. Add snow pea tips; stir-fry 3 min. or until wilted. Transfer to serving plate; cover to keep warm. Heat remaining oil in wok. Add fish; stir-fry 3 min. or until fish flakes easily with fork. Add dressing; cook and stir 30 sec. Spoon over snow pea tips. Be sure to use a nonstick wok to help prevent the fish from sticking to the pan and breaking into smaller pieces. Basa is a type of catfish that's native to southeast Asia.